Grady Health System's Georgia Cancer Center for Excellence (GCCE) has received a five-year, $2 million Merck Foundation Award as part of the new Alliance to Advance Patient-Centered Cancer Care. The Alliance was established to improve timely access to patient-centered care and reduce disparities in care for vulnerable and underserved populations in the United States. 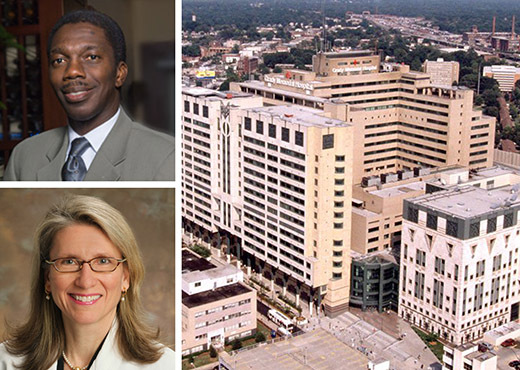 Roland Matthews, MD, chair of the Department of Obstetrics and Gynecology at Morehouse School of Medicine is principal investigator of the grant and Sheryl Gabram, MD, professor of surgery at Emory University School of Medicine and Grady Memorial Hospital, and a member of the Winship Cancer Institute, is co-principal investigator. The Alliance includes six organizations that were funded based on the technical merit of their proposed programs, their organizational capabilities and experience, relationships with community partners, and ability to promote sustainable improvements in the deliver of cancer care. In addition to Grady Health System, the Alliance includes the Johns Hopkins University, Massachusetts General Hospital, Northwestern University, Ohio State University, and the University of Arizona. The University of Michigan School of Nursing will serve as the Alliance's National Program Office. "The grant will enable the GCCE to impact day-to-day patient care as well as the strategic direction of our program," says Pooja Mishra MBA, MHA, FACHE, executive director of the Georgia Cancer Center for Excellence. "The funds will enable GCCE to seek patient-centered care designation from Planetree, Inc., a not-for-profit organization that partners with health care organizations to transform how care is delivered. In addition to seeking designation, patient support resources such as additional RN Navigators, an oncology dietitian, as well as an exercise coach will be added to the program."